Because we are hoping to do a lot more traveling in the near future, we decided to get new luggage for our upcoming trips and to make the switch to carry on, backpack style luggage. Our goals are to be able to carry it on for near every airline and to able to handle it all ourselves – even with rough terrain, steps, etc. After reading a few other people’s posts and watching several great videos about the differences between the two Osprey bags, what they looked like inside, how much they could hold, etc. I eventually decided to go with the Farpoint 40 for myself. I particularly liked that the bag was known for being comfortable to wear as a backpack, and I was glad to see the internal cinching straps. It looked like it held more than enough for what I had in mind and it got top marks from reviewers on several sites. My husband decided he would just make do with some of our existing luggage, plus his trusty laptop backpack. I had a harder time choosing a backpack for our son. He is large for his age, a broad shouldered 4’9″ at only 8 years old, so the smaller kiddie backpacks were out. 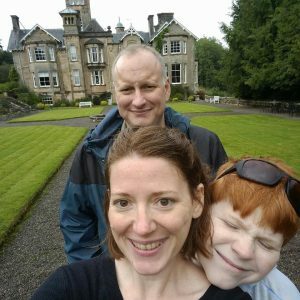 I asked for advice on the Worldschoolers Facebook group (a group filled with hundreds of traveling families) and got a variety of suggestions with no consensus. 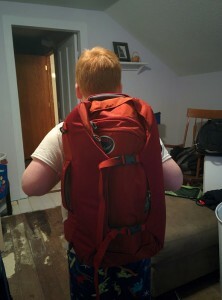 I wasn’t sure if he’d be able to handle a 40 liter backpack, but knew he wanted to bring along a fair amount of stuff. In the end I went with the Osprey Porter 30 for him. We also decided to order a couple of other bags to use as our “personal items” for my son and I. I was due a new purse anyway, so it was a convenient excuse to find something that would be a good fit for our traveling plans, and our son needed a secure bag to carry his electronics and a couple toys. For those I ultimately selected the Top Zip Shoulder Bag and React Small Messenger, both from Travelon. Mine looks like a pretty standard gray purse and his looks more like a lunch box than anything, but they are both slash proof, with lockable zippers and RFID blocking. I also decided to order some packing cubes and went with the Florious brand to help support a fellow traveling family. I also love that they’re made from recycled bottles. When I finished picking it all out and went to place the order on Amazon, I made a mistake. I had the Farpoint 40 and the Porter 46 both in my cart and removed the wrong one!! So my order was placed for our son’s backpack, the Porter 46 (the one I had decided not to get), our packing cubes and Travelon bags. After all that time spent researching I couldn’t believe I had not been more careful when I actually made the transaction. Oops!! Within 5 minutes or less I noticed the mistake and asked for that part of the order to be cancelled. Amazon sent me an email saying they’d do their best, but no guarantees. So I also placed the order for the Farpoint 40, figuring I might not have time to return the other one first. In the end it turned out to be a fortuitous error. All three were shipped and when the Porter 46 arrived my husband loved it! He decided it would be the perfect option for him, so we kept all three. My Farpoint 40 seems great, just what I had in mind. 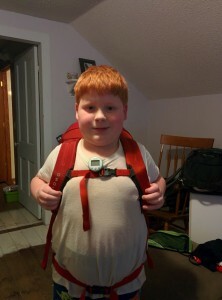 My son’s backpack seems about the right size and he immediately spent several hours wearing it, practicing running around the house to be prepared in case he’d need to run to catch a plane in future. 🙂 He practiced for several hours the next day as well. Hopefully those skills won’t be needed!! Reviews will come after we’ve used the items for at least one trip.